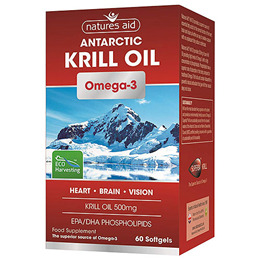 Natures Aid Krill Oil provides a superior source of essential fatty acids for the normal function of the heart, brain and vision all within an easy to swallow capsule with no unpleasant fishy odour or after taste. Natures Aid Krill Oil provides 500mg of pure Krill Oil providing high levels of Omega-3 with a high concentration of phospholipids. Phospholipids have a high superior rate of absorption in the body compared to traditional Omega-3 fish oils and contains Astaxanthin, a powerful natural antioxidant that give Krill Oil their natural deep red colour. Krill are the most abundant living organism on the planet and provide an environmentally friendly source of Omega-3. Superba® Krill are sustainably sourced from the cleanest waters of the Antarctic Ocean and are Marine Stewardship Council (MSC) certified providing consumers with a guarantee of sustainability and full traceability. Lipid extract from Antarctic Krill (Euphausia superba - product of crustaceans), Gelatin (Bovine), Glycerine, Sorbitol. Below are reviews of Natures Aid Omega 3 Krill Oil - EPA + DHA - 60 Softgels by bodykind customers. If you have tried this product we'd love to hear what you think so please leave a review.